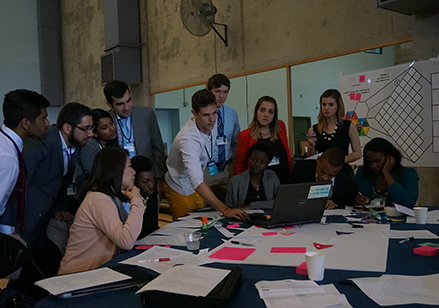 Students from across the globe came together at the Clinton Global Initiative University to work collaboratively in a Design Swarm to address a wicked environmental problem: collecting, purifying, and storing rainwater in an increasingly unpredictable climate. We’re all affected by climate change disrupting weather patterns globally, but none more so than those in the developing world. Multiyear droughts and massive floods have made collecting clean, potable water an increasingly difficult task for many. We can make a difference. And a group of 60 international students did just that at the recent Design Swarm hosted by Autodesk® Education Experiences at the 2016 Clinton Global Initiative University (CGI U) at the University of California, Berkeley. The challenge? To design a rainwater collection, storage, and purification system for individuals and communities in Asia and Africa. Five teams, comprising 60 students from 25 countries, collaborated in the Design Swarm—a group problem-solving process that brings diverse teams together to rapidly ideate, storyboard, design, and present solutions for a design challenge. Designs had to incorporate a product called Pure Sponge, a connected device that transmits metrics on rate of water flow, temperature, purity, acidity, nutrients, oxygen level, bacteria, and toxins to the user via Bluetooth. The student teams worked with Autodesk Student Experts and design mentors to model their designs in Autodesk® Fusion 360™. After 150 minutes of intense brainstorming, storyboarding, and 3D modeling, the five student teams presented their fresh and innovative designs to three judges: Randy Swearer, Vice President of Autodesk Education Experiences, Paige Rodgers, Senior Manager of Autodesk Foundation, and Carl Bass, CEO of Autodesk. The winning team was determined on the quality of their storyboard, the Fusion 360 model, their presentation, and social media interactions throughout the experience. Take on the challenge. Design Slams (similar to Design Swarms) are an awesome way to unleash the power of creative thinking. Gather your friends and host your own Design Slam using Fusion 360 to solve epic design challenges and create a better world. Check out our Fusion 360 tutorials and get started.